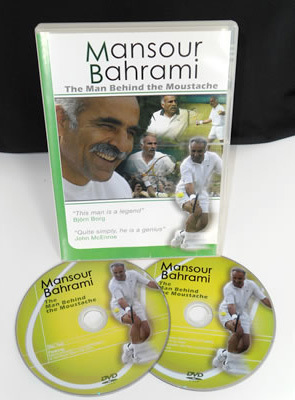 This double DVD (PAL) features an entire epic match with Mansour Bahrami, Boris Becker, Henri Leconte and IlieNastase played at the Royal Albert Hall, together with an interview with Mansour (French sub-titles) about his life and a photo slide slow. With his astounding array of shots and undeniable skill, Mansour Bahrami wows tennis crowds around the world. The story of his life though, is even more incredible. On this double DVD he tells of his struggle to play the game he loves and how, in the end, he triumphed over all the adversities life threw at him to achieve his dreams. From his early years playing with a dustpan to his memorable 1989 French Open Doubles Final, Mansour Bahrami has seen it all. His journey through the political strife of Iran, a new beginning in France and his rise as one of the most recognisable faces in tennis will surely stir your heart, whether you are a tennis fan or not.